The Son of God ! the Lord of Life ! For guilty man alone ! And cast away our pride. And crucify our sins afresh. As He was crucified ! And tempt the Lord no more : The Son of God! the Lord of Life ! To sound abroad His praise ! 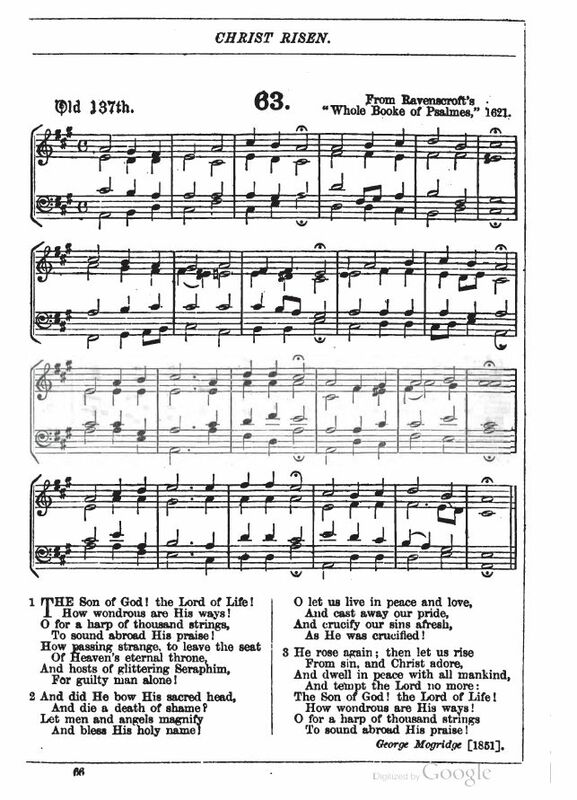 Sheet Music “Old 137th,” Ravenscroft, from John Hullah, A Hymnal Chiefly From “The Book of Praise” (London: Macmillan and Co., 1868), No. 63, p. 66. This is an excerpt from a much longer hymn, I Sing The Coming Of The Lord. John Ford, ed., Selected Hymns for the Use of Young Persons. Second Edition. (London: A. W. Bennett, 1866), #97, pp. 133-134. Attribution was to “A. Gray”, one of several pseudonyms of George Mogridge (i.e., “Old Alan Gray.). George Mogridge (17 February 1787 – 2 November 1854), a prolific 19th century writer, poet and author of children's books and religious tracts. He is chiefly known by his pseudonym of 'Old Humphrey', under which name he published 46 works, but also used the pen-names 'Jeremy Jaunt', 'Ephraim Holding', 'Peter Parley,' 'Old Alan Gray,' 'A. Gray,' and 'Old Father Thames'. He wrote approximately 200 published works, many of which are still in publication today, and at the time of his death it was estimated that over 15 million copies of his writings were in circulation. Source: George Mogridge (Old Humphrey), Wikipedia, alt. Also found in The Book of Christmas Hymns (London: T. Nelson and Sons, 1868), pp. 93-94.